This was created using the Mixed Media add-on kit for the month of March for the Flying Unicorns. It came with a 9x12 canvas, Loew/Cornell Simply Art Watercolor paint - which I have never used but was excited to dive in and give it a whirl. Oh where to start with this project. It was fun. It was messy. It was painty and inky. I used a lot of paper towels on this piece. 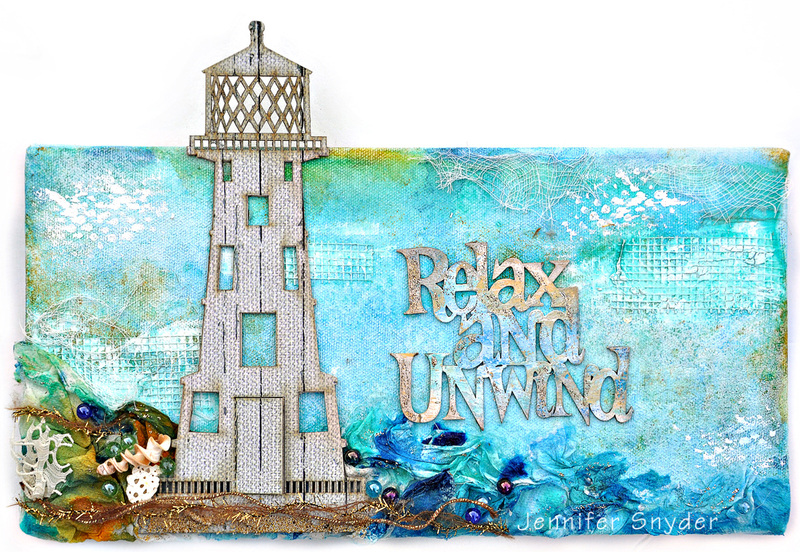 I also want to mention that the magnificent lighthouse and the chipboard words are from FabScraps -their new Beachcomber collection. Step 1. I first coated the canvas with blue water color paint. Then used a paper towel to dab some off in places. Step 2. I sprayed 13Arts Ayeeda mists in Navy and Turquoise around the page and dabbed off in places with my paper towel. Step 3. I misted 13Arts Ayeeda yellow on the page in places. Hmmmm Of course you knew that blue and yellow make green....but I've gotta tell ya, that was totally unexpected on this canvas. Ohhhhhh NOoooo I didnt want green. So I misted the whole thing with water to lighten up. I dabbed dry with a paper towel to remove excess paint and mist ...and green. The beauty of watercolor paints and mists - a little spritz of water and all is right again. Step 6. add more blue water color paint. Then used a paper towel to dab some off in places. Step 7. add more 13Arts Ayeeda mists in Navy and Turquoise around the page and dabbed off in places with my paper towel. Step 8. Add 13Arts Ayeeda yellow only on the edges of the canvas. Once I got to background finished, I had the most gorgeous paper towels ever. Ohhh they were gorgeous with the blues and the hints of Yellow mist mixed to make some green. I couldn't part with them so I decided to use them on the bottom of the page as water and landscape. Step 1. I bunched up the paper towel and blasted quickly with my heat gun to dry and stiffen it. Step 2. I painted gloss gel medium along the bottom of the canvas quite generously so that my paper towel would stick to it. Then I ripped strips of toweling and bunched them onto the canvas. I folded the excess paper towel around the canvas bottom edge and sides. Step 3. I gently covered the top of the paper towel with more gel medium - dabbing so as not to flatten the paper towel. Step 4.I used a paint brush and added more mist and paint to the land and sea where it needed more drama. Step 5. I sprayed a matte varnish to the top of my paper towel land and sea. When you touch it. it is stiff and does not look like toweling. Step 6. Added some Stickles in Platinum very very thinly here and there in the sea and the land. This fabulous chipboard piece is indeed fabulous...FabScraps fabulous. From the new Beachcomber collection. Step 1. I painted with gesso. Step 2. I ran a foam brush dipped in sand colored paint along the top of the chipboard. Then I wiped off with paper towel just to soften and make look more weathered. Step 3. I ran a little blue water color paint over the chipboard and wiped off. Step 4. I gently inked the chipboard with Tim Holtz Pumice and Tea dye distress ink. ( the little squares), a new Prima Mask, and small pieces of everyday cheesecloth. Grab the Mixed Art! 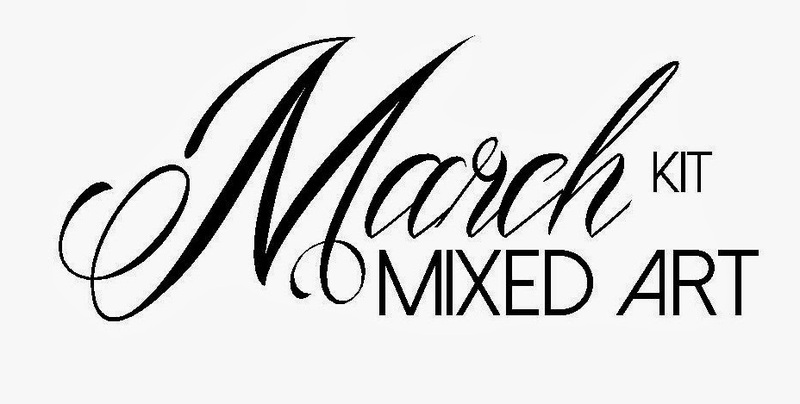 - the new add on kit to the March kit of the month. 2. Paint 6x12 canvas with blue watercolor paint. Dampen a paper towel and blot off in places. 3. Spray turquoise mist and blot off again with paper towel. Repeat with yellow mist, and navy mist. If the colors appear to dark for you, spray with water and blot off – repeat as often as necessary. 5. Your paper towel from the background preparation should be nicely covered in ink. Scrunch the paper towel and blast with heat gun to dry out and stiffen. 6. Decide where your sea and land will be on the canvas and coat that section generously with gel medium. Rip pieces of paper towel and stick to the gel medium creating the sea and land. 7. If you want to add more color to the land and sea, then add more ink to a paint brush and paint directly on to the paper towel. 8. When your colors are satisfactory, gently dab gel medium over the top of the paper towel to harden. When dry, coat with a matte sealant or protective spray. 9. For the sky, you can create cloud-like effects several ways. I used a stencil with small dots and applied molding paste for cloud effects. You can also use a stamp dabbed in gesso. You can use a sponge dabbed in gesso. You can paint bubble wrap and dab onto the canvas. 12. 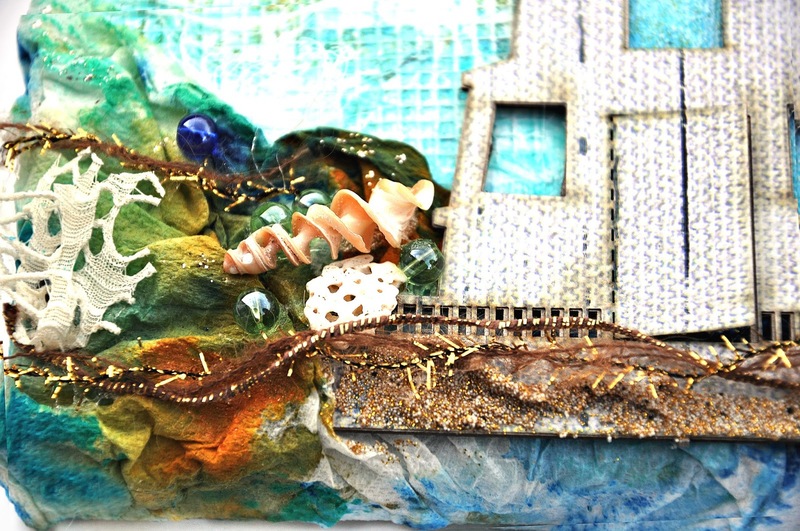 Cover the FabScraps Beachcomber Light house chipboard DC64015 with FabScraps Beachcomber Collection Jounal Die cuts MC64001A. 13. Glue lighthouse to canvas. 14. 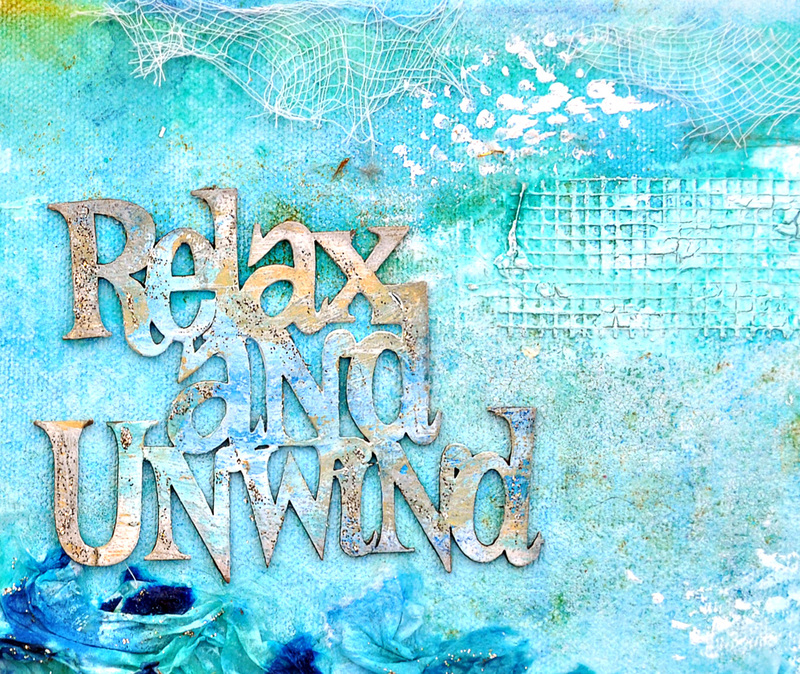 Cover FabScraps Beachcomber collection – Relax and Unwind Chipboard DC64006 with gessot. 15. 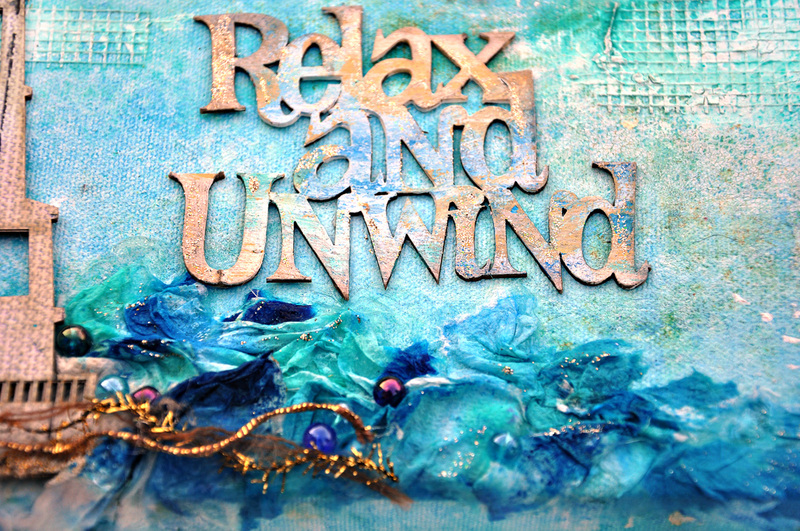 Dab some sand or tan colored acrylic paint on the chipboard words here and there. Wipe off. 18. Rub platinum glitter glue on the chipboard. Glue to canvas. 20. 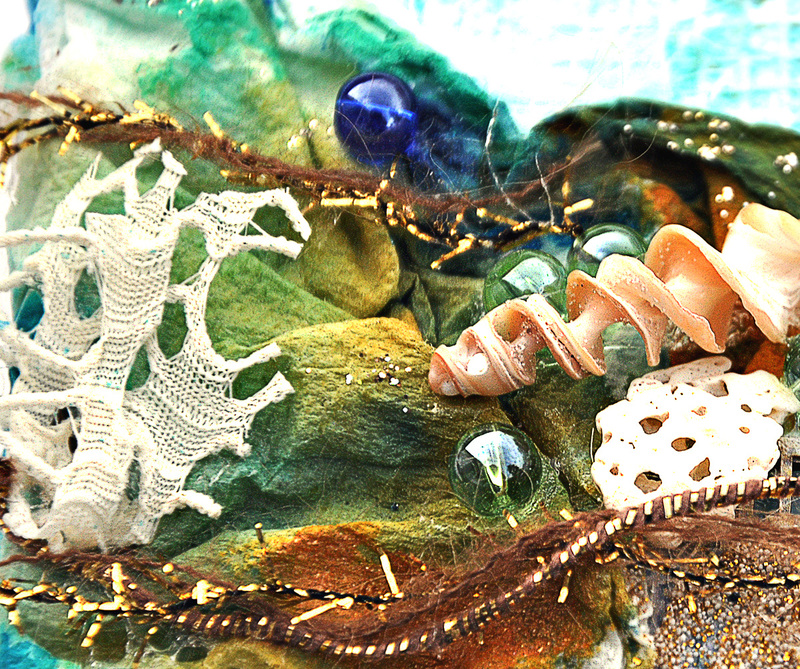 Add shells, beads, trims, netting and embellishments as desired. Flying Unicorns Kit of the Month Mixed Art!